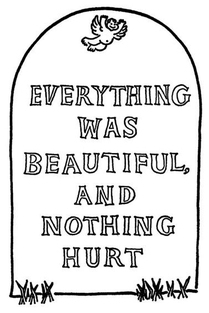 ﻿Kurt Vonnegut, Jr. died yesterday in Manhattan at the age of 84. The image above is what you’ll find if you point your internet browser in the direction of his official home page. 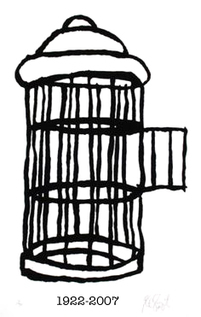 It’s an empty birdcage with an open door. Indeed, this bird has flown. Growing up, I spent a lot of time at the Lyndhurst Public Library. Sandwiched in between a beauty salon and a doctor’s office, the library wasn’t much to look at. In fact, it was really nothing more than two big rooms filled with an odd arrangement of bookshelves, a few tables, and some spartan metal chairs. There was a check-out desk in the front where the librarian would stamp your books before leaving. Outside was a rusty bike rack where I’d lock up my bike with a combination lock set to my address, 1-3-5-6. The librarian who worked behind the desk was my friend. She enjoyed pointing me in the direction of amazing books of all kinds. With her help I worked my way through biographies, autobiographies, histories, fiction, non-fiction, comedy, mystery, and more. One day she handed me a slim, brown, Dell paperback. It was titled Welcome to the Monkey House and on the cover was an illustration of two monkeys behind bars with hands outstretched. “It’s Vonnegut.” she replied, as though that was all the answer I needed to understand the book in my hands. And, as always, she was right. And even though I eventually outgrew the author who entertained me with characters like Billy Pilgrim, Kilgour Trout, Malachi Constant, and Elliot Rosewater, I never forgot him or his fascination with humanity and his wry observations about all it’s strangeness and charm. Scotsman Al Stewart, is a singer-song writer who often finds inspiration in biographies, autobiographies, histories, fiction, non-fiction, comedy, mystery, and more. Best known for his commercially successful recording Year of the Cat, I actually discovered him two records sooner on albums titled Past Present Future and Modern Times. I stuck with him for three records after Year of the Cat and then, like Vonnegut’s writing, I sort of outgrew his music. Thanks to the internet I have recently tracked down some of his earlier albums released between 1967 and 1972 and found them to be full of the same fascinating storytelling and captivating music that first drew him to my attention. You can only imagine my sense of glee when literature and music collided in 1975 on the album Modern Times with “Sirens of Titan,” the Happy Medium Song of the Day… and convoluted tribute to the writing of one of my all time favorite American authors, Kurt Vonnegut, Jr.